Manufacturers of pvc profiles used in several industries like pvc doors, windows, cabinets, electrical electronic air conditioning industries, automobile industries, advertising industries etc. The shutter styles made of Plaso A Section a uPVC Hollow Uni chambered Section of size 59mm x 24mm & 2mm wall thickness with in built edging on both sides. The styles will be mitered & joined at the corners by means of Galvanized Iron brackets of size 75mm x 220mm & self-tapping screws. Both the vertical styles of the shutter will be reinforced by inserting primered Mild Steel tube of 1.2mm wall thickness. The shutter lock rail made of Plaso H Section a uPVC hollow Uni chambered section of size 100mm x 24mm & 2mm wall thickness will be fixed to the shutter styles by means of Mild Steel U cleats & self tapping screws. The frame will be filled with Durapan panel a uPVC Multi chambered section of size 200mm x 20mm & 2.0mm wall thickness with the distance between the supporting ribs not exceeding 40mm & joined to one another by rectangular tail, slide fitting system & having a grooved surface appearance. The panels will be filled into the frame vertically. The door shutter will be tie bar with the help of nuts & washers at two places by inserting horizontally 6mm Mild Steel rod. plasopan pvc windows have numerous properties that make it the ideal window material and provide the highest standards for quality, durability and efficiency. 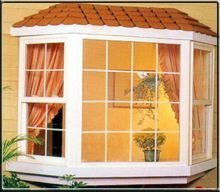 plasopan pvc windows are maintenance free they will not rust, corrode, or rot contrary to other windows made with traditional frame. our pvc components will never be altered by ultra-violet rays or acid rain as a result of our extrusions fabricated with "first generation" powder. pvc is a very poor conductor of heat and therefore makes an excellent insulator. In the construction industry, a material's u-value measures its ability to insulate with the lower the value, the better the insulant. This conserves energy and more importantly saves you money on your heating & cooling bill. a product of the latest in pvc extrusion technology, the solitaire doors from plasopan are made of a single infill panel loaded with a host of advantages unlike the conventional pvc doors. The single panel infill guards against deformation and gives unmatched durability. Unlike conventional pvc doors, solitaire doors have no visible joints; making them rust proof. Highly versatile, solitaire doors can be fitted into any kind of frame- wooden, iron, aluminium or stone. 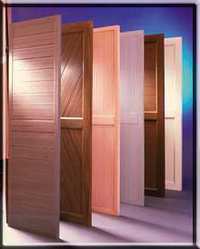 Add to that, solitaire doors come in a variety of colours and sizes to suit individual preference and taste. And last but not the least, they are having available at surprisingly affordable prices. Plasopan PVC Partitions are relocatable wall systems & offer many benefits when compared to fixed construction. They are modular, don't need painting or wall coverings, and are custom-made to fit the dimensions of your space. These can be used to make various types of partitions like half partition, full partition, cubicles, partition with glass and PVC profile and many other various types of partitions. Wall material, whether for use in the office, the home or any public place should be attractive to look at, generous, durable and easy to maintain. 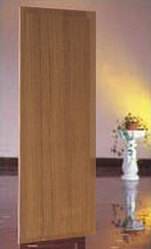 The wall panel sold by our company possesses all the strengths and advantages of PVC. It is suitable for all wall surfaces. Plasopan PVC ceiling system is light in weight, moisture resistant and reduces condensation and subsequent dripping from ceiling onto work surfaces. The cleanable, non-absorbent surface is UV stable and will not discolour. Plasopan PVC ceiling systems solves the problem of dirty, unhygienic ceilings that are difficult, and expensive to clean by providing a bright, durable and hygienic surface, which is easily maintained. This extremely practical ceiling system is suitable for any area requiring a fixed, non-porous, non-fibrous and non-absorbent ceiling. It's said that the kitchen speaks volumes about the home in which it dwells. The ideal modern kitchen is a blend of form and function of aesthetic beauty & total convenience. Plasopan PVC kitchen designs include a vast range of kitchen cabinets, tables and even wardrobes, chests and other storage ideas for the kitchen. We are among the pioneers to introduce the concept of PVC Portable Houses in India. These Portable Houses are available in sizes as desired by the end user. Made out of tough PVC material, these houses are very easy to fabricate, dismantle and refixed and are very useful for places where permanent construction is a hindrance. These houses are Portable as they can be dismantled from one location and the same house can be fabricate at another location. Presenting Glotec the most visible name in signage systems. 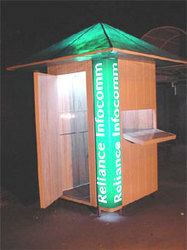 A first of its kind in India , Glotec signage systems are very contemporary in nature. Breaking the conventional way, instead of Aluminum Glotec uses PVC as its fabrication material. PVC not only helps in making the signage very light but also tough and durable in nature. Besides, it doesn't even require any nuts and bolts for fabrication. Sleek and very modern in design, Glotec signage's comes with a built-in Louver ventilation system that allows the heat to escape from inside the signage. The shutter styles made of Plaso Door a uPVC Hollow Tri chambered Section of size 90mm x 37mm x 75mm & 2mm wall thickness with an in built edging on one side & a groove on the other side. The styles will be mitred & joined at the corners by means of Mild Steel Zinc Galvanized brackets of size 75mm x 220mm & self tapping screws. Both the vertical & horizontal styles & the lock rail of the shutter will be reinforced by inserting primered Mild Steel tube of 1.2mm wall thickness. The shutter lock rail made of Plaso Lock Rail a uPVC hollow Twin chambered section of size 105mm x 37mm x 90mm & 2mm wall thickness will be fixed to the shutter styles by means of aluminum angles & self tapping screws. The frame will be filled with Pluspan 1.5mm panel a uPVC Multi chambered section of size 100mm x 12mm & 1.5mm wall thickness with the distance between the supporting ribs not exceeding 23mm & joined to one another by male & female snap fitting system & having a plain surface appearance. The panels will be filled into the frame horizontally with the help of self locking Plaso Snap Beading a uPVC Section of size 15mm x15mm & 1.5mm wall thickness. The shutter styles made of Plaso Door a uPVC Hollow Tri chambered Section of size 90mm x 37mm x 75mm & 2mm wall thickness with an in built edging on one side & a groove on the other side. The styles will be mitred & joined at the corners by means of Mild Steel Zinc Galvanized brackets of size 75mm x 220mm & self tapping screws. Both the vertical styles of the shutter will be reinforced by inserting primered Mild Steel tube of 1.2mm wall thickness. The shutter lock rail made of Plaso Lock Rail a uPVC hollow Twin chambered section of size 105mm x 37mm x 90mm & 2mm wall thickness will be fixed to the shutter styles by means of aluminum angles & self tapping screws. The frame will be filled with Duraking panel a uPVC Multi chambered section of size 305mm x 20mm & 1.0mm wall thickness with the distance between the supporting ribs not exceeding 40mm & joined to one another by rectangular tail, slide fitting system & having a grooved surface appearance. The panels will be filled into the frame vertically with the help of self locking Plaso Screw less Beading a uPVC Section of size 10mm x10mm & 1.0mm wall thickness & self tapping screws. The door shutter will be tie bar with the help of nuts & washers at two places by inserting horizontally 6mm Mild Steel rod. The shutter styles made of Plaso A Section a uPVC Hollow Uni chambered Section of size 50mm x 30mm & 2mm wall thickness with in built edging on both sides . The styles will be mitred & joined at the corners by means of Galvanized Iron brackets of size 75mm x 220mm & self tapping screws. Both the vertical styles of the shutter will be reinforced by inserting primered Mild Steel tube of 1.2mm wall thickness. The frame will be filled with Omnipan panel a uPVC Multi chambered section of size 100mm x 25mm & 1.2mm wall thickness with the distance between the supporting ribs not exceeding 26mm & joined to one another by tongue & groove, slide fitting system & having a plain surface appearance. The panels will be filled into the frame vertically. The door shutter will be tie bar with the help of nuts & washers at two places by inserting horizontally 6mm Mild Steel rod. The frame will be filled with Plasoking panel a uPVC Multi chambered section of size 305mm x 20mm & 1.0mm wall thickness with the distance between the supporting ribs not exceeding 30mm & joined to one another by tongue & groove, slide fitting system & having a plain surface appearance. The panels will be filled into the frame vertically. The door shutter will be tie bar with the help of nuts & washers at two places by inserting horizontally 6mm Mild Steel rod. The shutter styles made of Plaso A Section a uPVC Hollow Uni chambered Section of size 59mm x 24mm & 2mm wall thickness with in built edging on both sides. The styles will be mitered & joined at the corners by means of Galvanized Iron brackets of size 75mm x 220mm & self-tapping screws. Both the vertical styles of the shutter will be reinforced by inserting primered Mild Steel tube of 1.2mm wall thickness. The shutter lock rail made of Plaso H Section a uPVC hollow Uni. chambered section of size 100mm x 24mm & 2mm wall thickness will be fixed to the shutter styles by means of Mild Steel U cleats & self-tapping screws. The frame will be filled with Duraking panel a uPVC Multi chambered section of size 305mm x 20mm & 1.0mm wall thickness with the distance between the supporting ribs not exceeding 40mm & joined to one another by rectangular tail, slide fitting system & having a grooved surface appearance. The panels will be filled into the frame vertically. The door shutter will be tie bar with the help of nuts & washers at two places by inserting horizontally 6mm Mild Steel rod. The shutter styles made of Plaso A Section a uPVC Hollow Uni chambered Section of size 59mm x 24mm & 2mm wall thickness with in built edging on both sides . The styles will be mitered & joined at the corners by means of Galvanized Iron brackets of size 75mm x 220mm & self-tapping screws. Both the vertical styles of the shutter will be reinforced by inserting primered Mild Steel tube of 1.2mm wall thickness. The shutter lock rail made of Plaso H Section a uPVC hollow Uni chambered section of size 100mm x 24mm & 2mm wall thickness will be fixed to the shutter styles by means of Mild Steel U cleats & self tapping screws. The shutter styles made of Plaso A Section a uPVC Hollow Uni chambered Section of size 40mm x 38mm & 2mm wall thickness with in built edging on both sides . The styles will be mitered & joined at the corners by means of Galvanized Iron brackets of size 75mm x 220mm & self-tapping screws. Both the vertical styles of the shutter will be reinforced by inserting primered Mild Steel tube of 1.2mm wall thickness. The shutter styles made of Plaso A Section a uPVC Hollow Uni chambered Section of size 40mm x 38mm & 2mm wall thickness with in built edging on both sides. The styles will be mitered & joined at the corners by means of Galvanized Iron brackets of size 75mm x 220mm & self-tapping screws. Both the vertical styles of the shutter will be reinforced by inserting primered Mild Steel tube of 1.2mm wall thickness. The shutter styles made of Plaso A Section a uPVC Hollow Twin chambered Section of size 100mm x 37mm & 2mm wall thickness with in built decorative molding edging on both sides. The styles will be mitered & joined at the corners by means of Mild Steel Zinc Galvanized brackets of size 75mm x 220mm & self-tapping screws. Both the vertical styles of the shutter will be reinforced by inserting primered Mild Steel tube of 1.2mm wall thickness. The shutter lock rail made of Plaso H Section a uPVC hollow multi chambered section of size 118mm x 37mm & 2mm wall thickness will be fixed to the shutter styles by means of Mild Steel U cleats & self tapping screws. The shutter styles made of Plaso A Section a uPVC Hollow Twin chambered Section of size 80mm x 30mm & 2mm wall thickness with in built edging on both sides. The styles will be mitered & joined at the corners by means of Galvanized Iron brackets of size 75mm x 220mm & self-tapping screws. Both the vertical styles of the shutter will be reinforced by inserting primered Mild Steel tube of 1.2mm wall thickness. The shutter lock rail made of Plaso H Section a uPVC hollow multi chambered section of size 150mm x 30mm & 2mm wall thickness will be fixed to the shutter styles by means of Mild Steel U cleats & self tapping screws. The shutter styles made of Plaso A Section a uPVC Hollow Uni chambered Section of size 59mm x 29mm & 2mm wall thickness with in built edging on both sides. The styles will be mitered & joined at the corners by means of Mild Steel Zinc Galvanized brackets of size 75mm x 220mm & self-tapping screws. Both the vertical styles of the shutter will be reinforced by inserting primered Mild Steel tube of 1.2mm wall thickness. The shutter styles made of Plaso A Section a uPVC Hollow Uni chambered Section of size 59mm x 34mm & 2mm wall thickness with in built edging on both sides. The styles will be mitered & joined at the corners by means of Mild Steel Zinc Galvanized brackets of size 75mm x 220mm & self-tapping screws. Both the vertical styles of the shutter will be reinforced by inserting primered Mild Steel tube of 1.2mm wall thickness. The frame will be filled with Neopan panel a uPVC Multi chambered section of size 160mm x 30mm & 1.0mm wall thickness with the distance between the supporting ribs not exceeding 26mm & joined to one another by tongue & groove, slide fitting system & having a grooved surface appearance. The panels will be filled into the frame vertically. The door shutter will be tie bar with the help of nuts & washers at two places by inserting horizontally 6mm Mild Steel rod. It is the industry-leading Upholstered Wall System (acoustical stretched fabric mounting system ) for walls, ceilings and other interior surfaces. Engineered for superior function and design flexibility, Plasopan brings acoustic control to interior architecture without sacrificing aesthetics. A wide range of profiles are available to address almost any design need. It is a highly customized system for tightly stretching fabric over acoustical substrates. 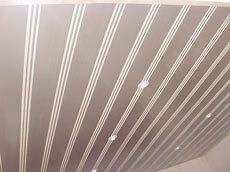 t is typically used on walls and ceilings, but is adaptable to any surface. It’s site-installed nature assures perfect fit to all adjacent work while eliminating the gaps, sagging, or misfitting common to premanufactured panels and other perimeter systems. It has far more flexibility in terms of design, lead time, and value engineering opportunities. Size limitation is based only on the fabric width, or the ability of the fabric to be sewn to the desired panel size. Unlike premanufactured acoustical wall panels (Upholstered Wall System), and other site built stretched fabric treatments, it is able to resolve the inherent weaknesses in other products attempting to perform its function. It offers technical superiority, and provides flexibility, performance, and economy. It is a cost effective tool for creating and enhancing interior environments with function, form, color and texture. 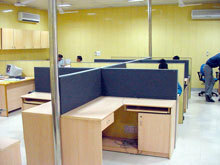 Panels are created per specification shape, width and height. The Subsurfaces (acoustical, rigid, tackable, nailable or combinations) are installed within the perimeter of the framework and secured between the fabric and the substrate. Fabric is then stretched over the framework. 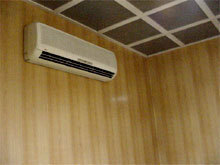 The above system is used in areas like cinema halls, auditorium, offices & others. Vinyl tubes are used for reinforcement in portable cabins/houses, Furnitures & other plastic fabrications. We make PVC angles which are used to cover edges for various application. We have a wide range of PVC angles available with us. Plaso Snap Beading is a major accessory profile used with plastic profiles to provide a decorative look. It is Mainly used as a supplementary profile in Vinyl doors & Portable Cabins. We specialize in making specialized compound as per the customer requirement for the profiles that we manufacture giving our customer an advantage of cost. We have our own tool room to make dies & jigs as per your requirements. All tooling is designed, engineered and tested under the watchful eyes of our experienced technical team, using the latest CAD facilities. We can extrude various types of plastics namely. 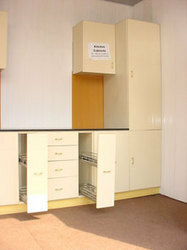 PVC furniture enables the best use of space, best value for money and add to the style of living. Your interiors get the touch of elegance with wide range of pvc furniture items like contemporary beds, ward robes, TV cabinets, partitions, shoe racks and many more. The ideal home is a blend of form and function of aesthetic beauty & total convenience. 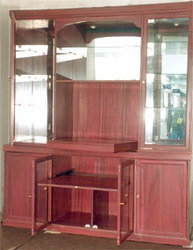 Plasopan PVC furniture items come in several designs which include a vast range of beds, kitchen cabinets, TV cabinets, tables and wardrobes, shoe racks and other storage ideas for the kitchen. Designed to support and protect marble and tile edges from chipping and cracking by intense pressure. These edges provide an attractive divider between ceramic tiles. The perfect joint wherever walls meeting other surfaces such as worktops. The base has punched holes to bond the strip and tile to the substrate. Edge dividers are manufactured from high quality pvc material in the sizes shown in our section chart, and can be made to order from other plastic materials. This range of decorative and functional trims will finish the edge of any tile or marble surface, in over four colors, and also can be made in any custom color, if required. the base has punched holes to bond the trim and tile to the substrate. The visible round edge will smoothly cover the cut or unglazed tile edges and when grouted will provide a rigid, hard wearing, durable & good looking surface. This range of decorative and functional trims will finish the edge of any tile or marble surface. Used In plastic furnitures & kitchen cabinets. Accessory Profiles for Kitchen Cabinets & Furnitures. Vinyl Skirtings are used as Decorative floor borders.